As Starlight's senior year of high school nears its grand finale, the events and milestones continue to pile up. The latest of those memorable moments was the senior prom. First order of Prom business: the dress. Every girl wants a special prom dress that fits her personality, style, body type and skin tone. Sometimes a dress that hits all of these marks can be difficult to find. In our case the perfect dress, which happened to be a one-of-a-kind custom design, literally appeared to us as if by fate. She envisioned a pretty Elsa-inspired blue sparkly gown, but took this pink beauty into the fitting room simply because it was the only dress in the shop in her size. She loved the body of the dress and wanted to be sure it fit perfectly so that she could then seek out a similar style in blue. But something happened in the fitting room. She fell in love with this dress, in this color. Immediately she said "yes" to the dress without hesitation. She had looked on Pinterest for braids when her original theme was Elsa-inspired and decided to stick with that idea with this dress as well. The dress itself would really be the showpiece so she wanted to keep her accessories to a minimum and her hair and make-up soft. 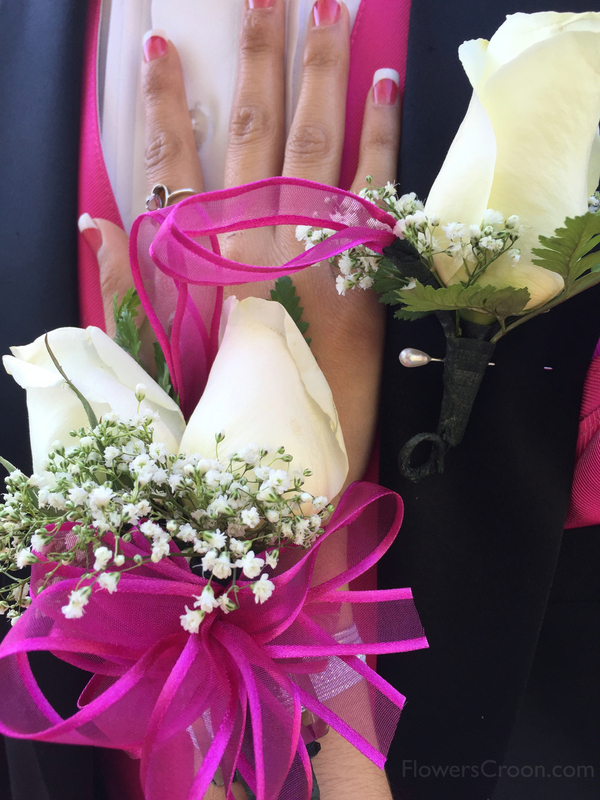 For her nails, she went with a classic french manicure, adding the "pink and white" twist. An unnecessary thing these kids do now is put a lot of effort into the "promposal", i.e. the act of asking someone to be your prom date. I shouldn't have to tell you how incredibly lame I think that term is, but I will admit that my daughter discovered a very sweet and surprising promposal at our door one night. I've never once in her lifetime called my kid a princess, but in my old age I'm starting to soften up a bit and I thought this was a super sweet invitation. Once I saw her in the dress my heart melted - she did look like a princess straight out of a fairy tale. How is a princess supposed to get to the ball? Why in a 2015 Convertible Ford Mustang, of course! Her dad showed up at our doorstep just a couple of hours before the prom with this muscle machine - which did turn into a pumpkin at about 2 am. Before the prom, all the girls and their dates gathered at a local nursery's gardens for photos. It was sweet to see them all dressed up and excited for their prom, and most importantly, enjoying their dwindling time together as kids. "How did this happen so fast?!" Congrats to the Class of 2015! I hope everyone had a lovely prom.